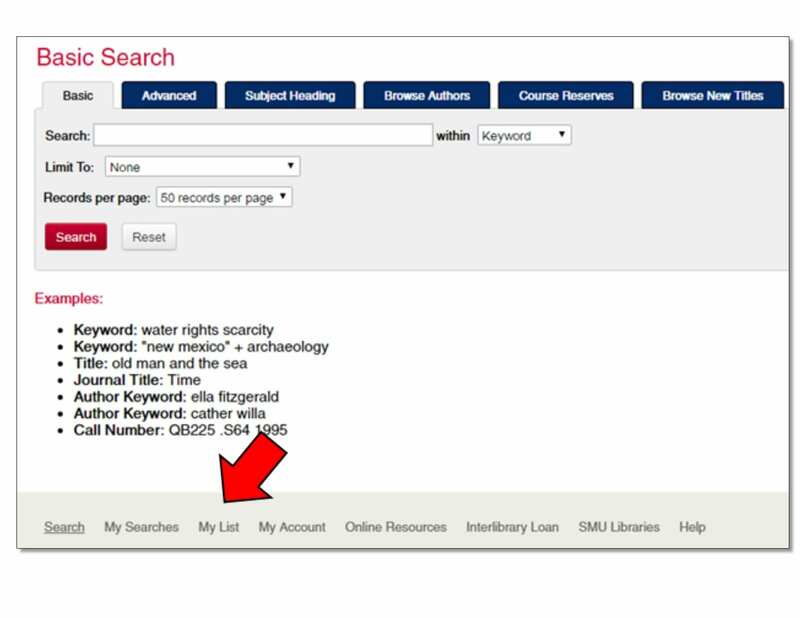 All SMU libraries have implemented a new search system. The new system, Ex Libris’ Alma and Primo, replaces the 18-year old Voyager library system and the Discover SMU Libraries search. The new library search provides an enhanced user experience while providing one simple search of all of the SMU Libraries’ collections. The new system is up as of June 15th. All library holdings, including all course reserves, are searched in one system. Individual databases are all available and can be searched individually. Links to library materials in Canvas courses may need to be updated. Contact your library for assistance. As with any major system migration, there may be a few unanticipated issues which arise, so we ask for your patience. We will communicate any updates on the Central University Libraries News website. To learn more about the new library search, contact your subject librarian to schedule an individual appointment or library instruction session, or contact the research help or circulation desks at any of the SMU Libraries. Quickly generate citations for articles, books, and more. Easily export those citations into your preferred citation management tool such as RefWorks or EndNote. Create an eShelf of your favorite items and organize using labels. Discover more by virtually browsing our shelves by call number, title, or subject without ever having to leave your home. Use your SMU ID and password to renew books, view search history and favorites, place holds and requests, and more. With the new library system migration on June 15th, library accounts have been simplified into one easy-to-use interface. 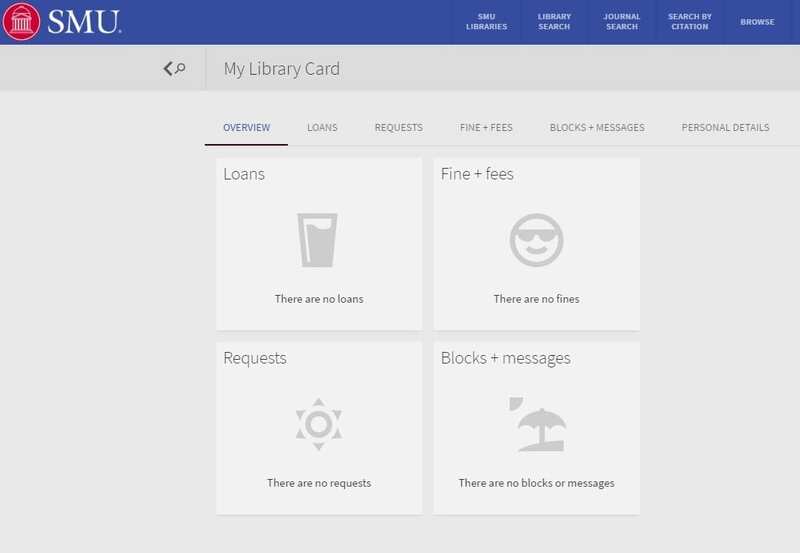 The new library account system allows you to view check outs and holds, renew your materials, view fines and fees, and update your personal information. In addition, you can use the same account to save and organize your favorite items and searches in the library search. Try it out now by logging in with your SMU ID and password. Note: Any users who are not current faculty, students, or staff will be able to log in using their Facebook account. Emails with access to the new login will be going out soon. Please check with your library if you need any assistance. We are working on migrating the list of eJournals into the new system. For now, keep visiting the former eJournal title list. While a majority of links to databases in the “View It” section of the new library search work, a few have not been fully updated yet. Talk to the librarians for help locating full-text to these or simply Request Scan inside the page for our Document Delivery service. The SMU Libraries are entering the final phase of migrating to the new cloud-based library system. Here is what you can expect to happen this week. Last day for My List and Saved Searches data to be retrieved from current library catalog. Current library system will be frozen. You will not be able to log into library accounts during this time. You will still be able to search for and check out books, DVDs, etc, but item availability may not be up-to-date. Discover search and individual databases will not be impacted. New library system go-live date. New borrowing policies go into effect. Not all library materials will be immediately represented in the new search. LibCat and Discover searches will no longer be available. Visit Central University Libraries News website for any updates and impacts. Let us know what you think! Send us your feedback. Single easy-to-use interface allows for you to find better information faster. The SMU Libraries moved to a new library system on June 15, 2017. The new system replaced the 18-year-old Ex Libris Voyager system and the Discover SMU Libraries search. As a result, the library catalog at libcat.smu.edu and the Discover search are no longer available. Visit the new library search page. We need your help testing our need library search tool! The full version of the new search tool will be available on June 15th, but we still need more feedback. Feedback will be collected through one-on-one interviews which will last approximately 15-20 minutes. You will receive a free Starbucks™ coffee of your choice as a small token of our appreciation for your time. I am contacting you since you’re listed to teach a summer course during the SMU Libraries’ system migration on June 15th. The new system, Ex Libris’ Alma and Primo, will replace the 18-year old Voyager library system and the Discover SMU Libraries search. 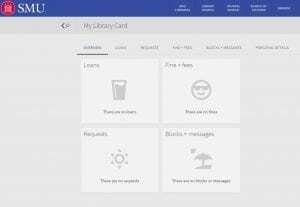 The new library search will provide an enhanced user experience through one simple search of all of the SMU Libraries’ collections. In the week leading up to migration on June 15th, you and your students will be able to search for library material (Books, DVDs, etc) and you can check-out/check-in materials throughout the migration, but information on availability may not be accurate. On June 15th, when we “go live” you will see a new interface which will be more intuitive and user-friendly. Course reserve material will migrate to the new system. If you have questions about access for the summer, contact your library. Individual databases will not be impacted during the migration. As with any major system migration, there may be a few unanticipated issues which arise. We ask for your patience and will communicate any changes during the transition on the Central University Libraries News website. To learn more about the new library search, schedule an individual appointment or class library instruction session with your subject librarian, or visit the research help or circulation desks at any of the SMU Libraries. I’m always happy to help as well, so if you have questions, please let me know. And if you have any feedback on the new system, I’d love to hear it. With the transition to the new library system and online catalog in June 2017, there will be some minor impacts to users. The current library catalog offers the “My List” feature which allows users to store lists of book titles in their account. While the new library system will have similar features under the name of “Favorites,” we are unable to transfer the “My List” data. Users will not have access to the current “My List” feature and data after June 10, 2017. We are asking any users to please print, export, or email lists as soon as possible if they wish to keep this information. Instructions are listed below. If users no longer wish to keep the data, no further action needs to be taken and the lists will be deleted during the transition. We are emailing “My List users” directly to inform them of the change, but some may not have email addresses in system. Questions can be directed to any of the SMU Libraries desks or to askalibrarian.smu.edu. 2. Select “My List” at the bottom of page. 4. Click “Select All.” Then, choose Print, Export** (Exports to RefWorks or EndNote only), or Email. ** The Export option only exports 10 items at a time. Please double-check that all items have been exported. Try out the beta version of our new library search! After you have taken a test drive of the new search, help us build a better search by letting us know what you think in our feedback form. The beta version of the library search is for preview and testing purposes only, since less than 1% of the libraries’ collections are available through this search. All of the records from SMU’s eight libraries will be available in the full version of this search on June 15th after a two-week process of uploading all of the records into the new cloud-based system. If you’d like to give feedback in person, feel free to stop by the Fondren Library Collaborative Commons on April 27th from 12-1 pm. Finding the research you need is about to get a lot faster at SMU. The SMU Libraries are proud to announce the arrival of the Next Generation Library System. In June 2017, the libraries will “go live” with the Ex Libris Alma library management service and Primo discovery and delivery service. Alma and Primo will serve as the first enterprise system at SMU to be entirely cloud-based, greatly reducing the need for maintenance and associated costs. Alma is an easy-to-use platform which replaces a variety of library products including the 18-year old Voyager system which SMU’s eight libraries use to manage patron records, course reserves, circulation information, and library catalog records. Major advantages of Alma include the streamlining of behind-the-scenes workflows, thus enabling library staff to keep pace with an ever-changing information environment, and the rich analytics which provide high-levels of insight and foster better decision-making in shaping collections around the SMU community’s research needs. Primo provides an all-in-one search of the SMU Libraries’ vast print, electronic, and digital collections. It will replace both the current library catalog and the Discover SMU Libraries search in addition to pulling together results from other platforms such as bepress, ContentDM, and RefWorks. Primo’s sophisticated search and relevance ranking algorithm ensures the SMU community will be even more productive and innovative in their research. How will SMU researchers benefit from Primo? Faster: Save time by searching almost all of the SMU Libraries’ collections and beyond in one simple search. Easier: The enhanced user experience will make searching less frustrating. More Discovery: Explore and learn through automatic recommendations, virtual title browsing, and citation trails. Personalized Search Experience: Log in to save your research preferences. Save your items in your eShelf and easily export to RefWorks or EndNote. On-the-Go: Improved, mobile user interface allows researchers to search on their favorite mobile device. Seamless Integration: Alma and Primo work together to provide one user-friendly account for most library needs.